Lima, Peru -- Ambassadors for Peace in Peru were very active in December 2010 following the announcement of the objectives of the "Abel UN" Peace Campaign on November 22 at the UPF World Assembly in New York. 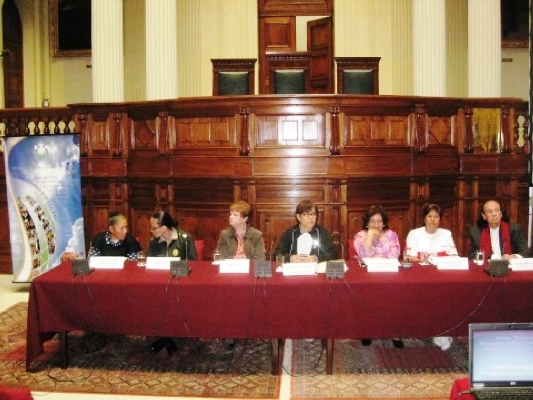 Under the theme of marriage and family, and in co-operation with Congresswoman Mercedes Cabanillas, a forum was held in the Peruvian Congress entitled: "Strategies for the Prevention of Family Violence in the Framework of a Culture of Peace." Dr. Cabanillas was appointed an Ambassador for Peace in 2005; she is currently the Minister of the Interior of Peru and was previously a President of Congress in 2006-07. She spoke of her commitment to protect and support women and the family as well as her desire to work together with like-minded organizations including the Universal Peace Federation. Another key speaker in the forum was Dr. Luis Huarcaya, former government minister and past president of UPF-Peru. He spoke about the role given by God to women and emphasized that there is no greater force in the world than the love of a mother. He also introduced to the capacity audience of women from all parts of society that the Universal Peace Federation is a defender of the most sacred thing God created: the family. The meeting concluded with the appointment of new Ambassadors for Peace. Also in December, as in previous years, various Ambassadors for Peace took the initiative to raise funds and distribute food and presents to the neediest sectors of the Peruvian population. In Lima and in Trujillo, working together with local churches and other organizations, Ambassadors for Peace invested their time and energy to bring humanitarian relief to young and old alike.